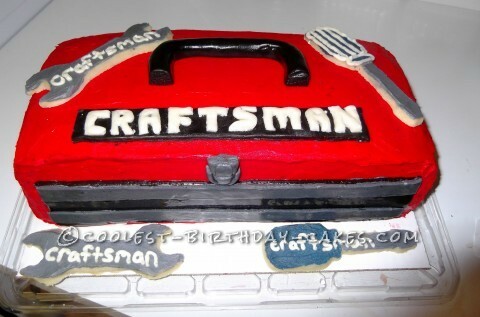 This is a Craftsman toolbox cake I did for my handyman Dad. It was inspired by a wrench and screwdriver cookie cutter set I found. I made some of those out of sugar cookies and placed them on and around the cake for decorations. The cake was chocolate sheet cakes that I cut into rectangles and stacked and filled with caramel pecan frosting. The outside of the cake was red butter cream. It ended up getting a lot of crumbs in the frosting because the cake was so moist, I should have stuck it in the freezer to firm up before frosting it. The Craftsman logo was cut by hand by my husband. If you have alphabet cookie cutters that are similar to the logo that would be much easier. The rest of the decorations were homemade fondant shaped to look like the toolbox parts. It is much easier to print off a picture and have it next to the cake as you work. Overall, I thought the cake was cute and my Dad and family loved it! Birthday cake idea Posted by Katie S.